We’ve sourced out some incredible gold flatware for you to drool over. Imagine one of these sets proudly displayed on your holiday table for everyone to “ooh” and “aah” over. Your friends and family might even be afraid to “break them in.” Paired with your best china, any one of these sets will add a shine to your holiday table presentation. All of these sets are rated well above 4.0 stars on Amazon, and all of them except the Lenox ones come with free shipping. And there’s Amazon’s incredible return policy, of course. Each also has gives you some sort of hostess set for additional value. You don’t often see those with smaller sets or inexpensive ones. This fine sterling silver flatware set comes with golden accents in a gorgeous weave pattern on the base and top of the handle. What really makes this set stand out for me is that the pieces are made of fine sterling silver rather than sterling silver or stainless steel. 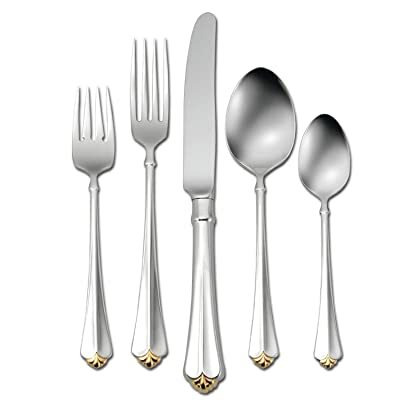 Most flatware sets are sterling silver (not quite as high-grade but high-content silver at over 90%) or even stainless steel of varying grades or silver-plated. But this is well-crafted flatware, with a 99.9% silver content, so they’ll make a classy statement on your table. My other favorite part is definitely the pattern. I love the weave designed into the top and bottom of the handles. Whether you’re after a stunning decorative set or one for formal dinners, you’ll rake in compliments for them. If you have a fancy china pattern or design, sometimes the “simple flatware” patterns don’t look just right. And if you have gold-rimmed china, these gold sets can be stunning. Be sure to take a close look at this one to see if it is a good match. About the only downside to this set is pricing, even at Amazon. So if you fall in love, be sure to check out other sellers at the “new” price level. Sometimes the pricing can be significantly better on some sellers, especially when the set has such exceptional value like this one. But given the price, make sure you’ve chosen a reputable seller. Right now, besides Amazon itself, only one other seller — Ava and Lucy — is selling this set and they do have a better price. They also have a great 5-star reputation with over 5,800 people providing feedback. I prefer Amazon as the seller myself, but this gives you some extra insight to make the best choice for you. 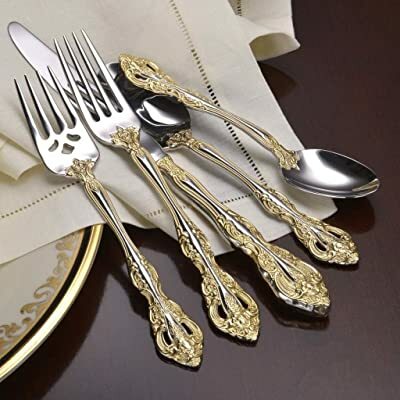 This isn’t an inexpensive set by price or quality, but if you’re looking for upscale, high-end, fabulous quality flatware, I encourage you to take a look. Looking for something simpler? Try this 18/10 stainless steel flatware — it comes with 24K gold electroplate and has golden tip accents in a romantic fleur-de-lis pattern. If your china or stemware is trimmed in gold and would look good with an understated flatware pattern, be sure to check out this set from Oneida’s Heirloom Collection. I especially appreciate the larger hostess set here, with some pieces that five-piece or six-piece sets sometimes don’t include or they swap for another piece you also need, like a casserole spoon, servall, and ladle. If you’re looking for a classic pattern that will never go out of style, I believe this will be your icing on the cake for an enviable holiday display. The big thing with formal place settings is that it always comes down to your china design. You want a good match. So check out this pattern if you think it might be a good complement to your china set or stemware and add elegance to each place setting. The 24K gold electroplate is a thin sheen of 24K gold added to the stainless steel to provide some additional “amazing” to the basic pattern. For 18/10 stainless steel with gold electroplate, the price is surprisingly reasonable at Amazon. I looked around and Bed, Bath, & Beyond carries the service for 4 but without a hostess set, and the comparative pricing isn’t anywhere as good there. Target and Walmart don’t carry it at all. So for a quality offering in high-end stainless steel with gold trimming, I like the looks of this one. I think you will, too, if you like the simpler touch. Amazon also sells this set with service for 8 without the additional hostess items. If you want to go that route, you can find them here. I just find the full 48-piece set to be a much better investment with more value. 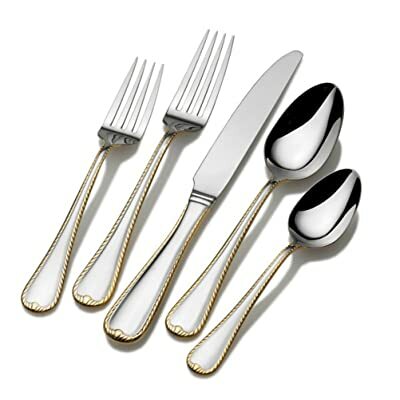 This 18/10 stainless flatware comes with 18K gold electroplate and has golden accents twined throughout the handle. It’s an elegant pattern worthy of Michelangelo himself and it’s sure to go well with the fanciest china. This set catches attention the moment you feast your eyes on the table and decorations. And, if you’re big on fancier gold patterning, it’s probably the best set of the five. The 18/10 stainless steel, as I mentioned in the Oneida above, is the best stainless steel choice for your flatware. Unlike the 24K gold electroplate in the Golden Juilliard, this is a step down with 18K gold. My guess is that this is to keep the cost down because the gold plating is more extensive. With that recommendation, you owe it to yourself to take a look. This 18/10 stainless flatware comes with gold electroplate and has two golden bands on the handle. This is a true Lenox quality set. 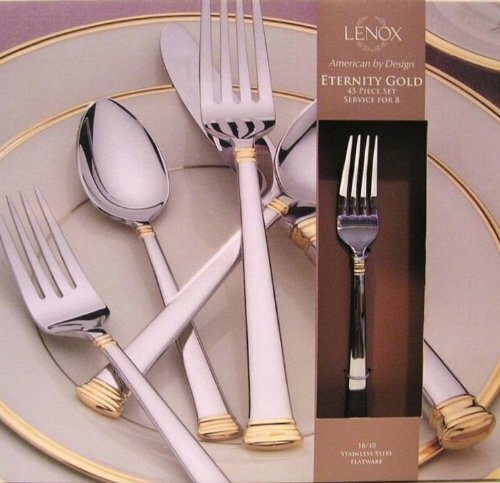 Although the name here (“Eternity Gold”) differs slightly from the set sold on Lenox’s site (“Eternal Gold”), one reviewer confirmed that the difference is mainly a design change for weight, and a slight flattening of the flatware angles. This is sold under the Eternity Gold name (instead of Eternal Gold, which is a slightly different set) only for this 45-piece set. If you check out Amazon’s comparison chart on this set’s page, you’ll notice the price difference as well. Eternal Gold sold on on Amazon as well as Lenox’s site would cost 2-3 times more respectively, and without the hostess set to boot! Other than the slight difference in weight, as one reviewer said, some of that is apparently because the Eternity Gold is limited to a specific piece count and configuration packaged for retail sale. I suspect that the gold might be a slightly lesser gold quality than 24K like Eternal Gold although I couldn’t confirm that. But from reviewer comments, that doesn’t appear to be an issue affecting the presentation or use of this set. My guess is that Lenox will charge through the nose for the hostess set for this one or make you buy single pieces. So if you like this 45-piece with service for 8, then you should consider your options here. If you have gold-rimmed china or gold-banded crystal glassware, this set looks like it will be a beautiful but understated complement to them. One reviewer researched the name, warranty, and other issues with Lenox themselves, and confirmed the packaging and warranty information. This set comes with the Lenox lifetime warranty as part of their Breakage Replacement Program. As a reviewer put it, “Everything is beautiful. I was afraid they could look barroque but instead this flatware looks elegant. I was concerned also about the weight; however they are not too heavy or too light, and perfect weight for my taste…” (read more reviews here). If you’re looking for good quality, nice-looking flatware with a reasonable price, be sure to consider this one. This 18/10 stainless flatware comes with 24K gold electroplate and has an outer ridging on the tapering handle. If you favor Mikasa and its designs, you’ll like this simple set. For gold flatware designs, this one’s a little different. Both the look of the rolled edge and the tapering lend themselves to an interesting look and feel. If you have gold-rimmed china or gold-banded crystal glassware with an unsual edge, this might complement them better than complicated designs or overly traditional simple designs. As a reviewer put it, “The gift recipient was very pleased with the quality of the flatware set, its simplicity and beauty as well as the contrasting gold…” (read reviews here). If you’re looking for high quality, brand-name, nice-looking flatware with a reasonable price, be sure to check this one out further. Most people are aware that fine sterling silver and regular sterling silver flatware require careful handling. But it’s worth repeating when you’re spending a fair bit and wanting them to last. You should always handwash these pieces with a softer, less-abrasive soap. Dry them right away to avoid spotting, and use a soft chamois or soft cloth to prevent scratching or damage. Also, silver needs to be polished regularly, at least twice a year even if you don’t use it. That will help keep it in top shape for years to come. While people believe stainless steel is dishwasher safe because it is “stainless,” I strongly believe — just like cooking knives — that it is still a good idea to wash them by hand. Like silver, you should also immediately dry your good flatware. Long experience has taught me that even “stainless” items can spot and corrode in the dishwasher no matter what they say. And since gold is a softer metal, even in electroplate, it can damage more easily. Not to mention the terrible potential for bending or distorting items put in the dishwasher just because they were pushed against other residents of your dishwasher. So take a look at some of these if you’re looking for gold flatware with service for eight. They’re gorgeous, with a nice ranging of prices, and a good place to start in your hunt for excellent table settings. How many people do you usually serve at your holiday and family gatherings? Do you like plain or fancy flatware? Share your favorites with all of us. Like more of these? Subscribe to our RSS feed and get loads more! 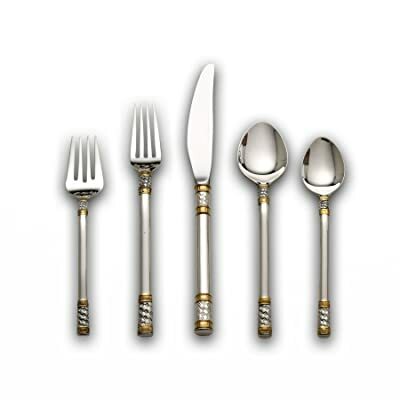 One Response to "Top 5 Highly-Rated Gold Flatware Sets – Service for 8"
Thanks for helping me to see things in a dinfereft light. As Editor-in-Chief of Real World Reviews Inc. and The Cook’s Measure, my goal is to provide excellent content, whether it is cooking tips and articles or recipes. I want to review and recommend quality products to help you find the right cooking products for you. As a cooking enthusiast, just like you, I love to find new tools for my kitchen and new techniques or recipes to try out with my husband and friends. The Cook's Measure is a participant in the Amazon Services LLC Associates Program, an affiliate advertising program designed to provide a means for sites to earn advertising fees by advertising and linking to amazon.com, endless.com, MYHABIT.com, and woot.com. Amazon, the Amazon logo, AmazonSupply, the AmazonSupply logo, Endless, the Endless logo, MYHABIT, and the MYHABIT logo are trademarks of Amazon.com, Inc. or its affiliates.